Chemists have elements. Influencers have plays. Vetted by Fortune 100 companies and taught at leading research universities, the Playmaker Influence System™ comprises three frameworks that identify and integrate the strategies, cycles, variables and conditions of influence programs and influencers. Taxonomy of Influence Strategies™ The front door to a patented, precise and proven ontology that identifies, describes and classifies the fundamental units of advocacy and persuasion (aka, influence or social plays). This first-of-a-kind ontology features 23 stratagems and three surrogates observed in communications, marketing, media, military and government intelligence, politics and sales across professions, governments, regions, customers and cultures. Cycles of Influence Two hand-in-glove methodologies that explain how plays are conceived, introduced and managed in real-time for competitive and collaborative advantage. Ideal for simulations, the basic cycle is a two-player model that illustrates the ongoing evaluation, planning, simulation and execution of plays between you (the focal plays) and your competitors in a continuous cycle of positioning, re-positioning and de-positioning. The multiplayer full cycle, a superset of the basic cycle, includes customers, constituents and collaborators in a repeating exchange of strategies for mutual and competitive advantage. Factors of Influence A simplified reference of the many factors that describe and determine the context of plays. Like dials on a sound engineer’s board, they are the variables and conditions that playmakers control — or that control them. 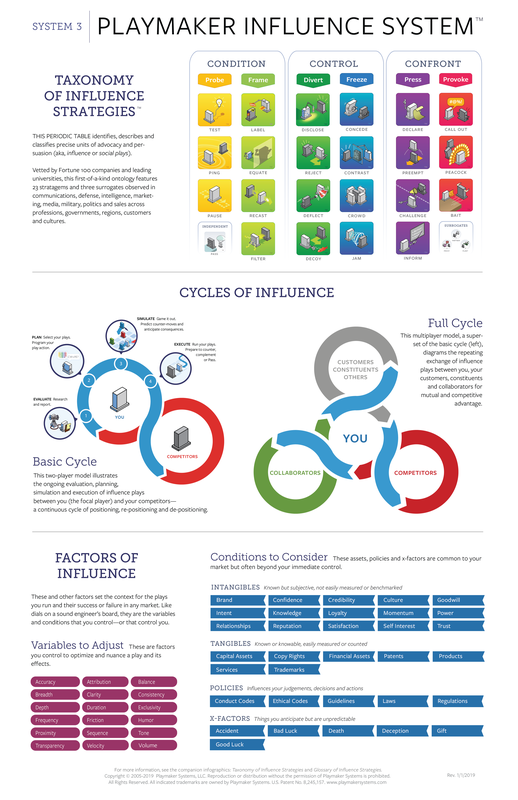 For a printable infographic of the Playmaker Influence System (above), please tap here.